Amarillo, TX, May 27, 2015 – In order to further achieve their company mission to exceed the customer’s expectations and provide the most professional service possible, EFA (English Field Aviation) is offering their extensive aircraft detailing package to customers at no charge. Any King Air customer who has a phase inspection completed at either of the EFA locations is eligible for the complimentary detail package. The package is made up of multiple detailing and finishing services including a full machine buff and wax, wheel well cleaning, De-Ice Boots treatment, bright work polish and full interior detail. The machine buff/wax deep cleans and polishes heavily contaminated surfaces and removes heavy oxidation, carbon buildup, oil, and fuel stains in order to restore paint to “like new” condition and provide a layer of protection against dulling, fading and debris buildup. The De-Ice Boot treatment cleans and restores the boots to proper condition, ensuring the safe operation of the aircraft and providing a protective layer between the boots and external elements. Bright work polish offers complete cleaning and polish of all bare metal surfaces; spinners, leading edges, engine intakes, etc., which are all machine buffed to a mirror finish. The complete interior detail includes a deep cleaning of all interior surfaces, interior vacuum and wipe down, leather and vinyl conditioning and minor stain removal. 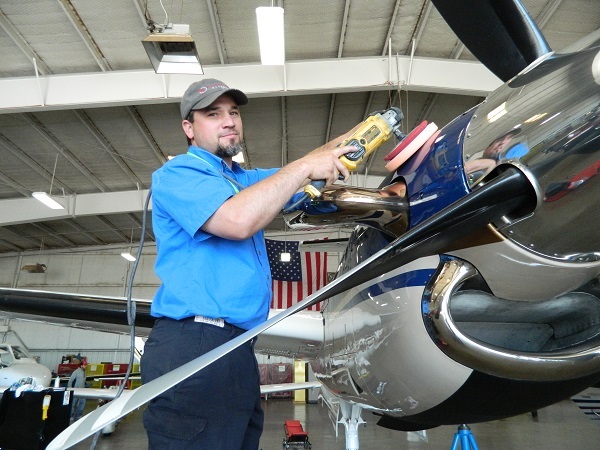 The time and resources needed to complete the detailing package varies based on the type of King Air being serviced, but the package has been valued at $3,000. EFA has a variety of additional detailing and finishing options that can be purchased individually or added to the detail package. EFA is a Jet Stream dealer and utilizes a variety of Jet Stream products in their detailing process. To learn more call 1-806-322-1971. Specializing in King Air aircraft, EFA (English Field Aviation) provides professional aircraft maintenance, avionics upgrades and inspections and refurbishment services. From small inspections to complete renovation packages, EFA has the comprehensive capabilities to meet client requests and deliver concierge quality customer service. As an FAA approved Part 145 facility, EFA features fully trained and certified technicians who utilize the latest tools and practices to deliver accurate, timely and reliable aircraft service you can trust. Offering two convenient, mid-continent locations in Amarillo, TX, EFA is perfectly positioned to serve you at Rick Husband International Airport (KAMA) or Tradewind Airport (KTDW). To learn more visit www.efa.aero or call 1-806-322-1971.